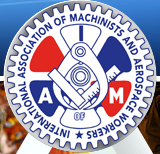 The International Association of Machinists and Aerospace Workers was founded when the International Association of Machinists grew and included Aerospace Workers in its union in 1964. The IAM was founded in 1888 when 19 Atlanta, GA workers formed a trade union. In 2003 R. Thomas Buffenbarger and several Members and Officers of the International Association of Machinists and Aerospace Workers, including General Secretary/Treasurer Warren L. Mart and General vice-Presidents Lee Pearson, Dave Ritchie, Alex M. Bay, Robert Roach, Jr., Robert V . Thayer, Lynn D. Tucker, Jr., Robert Martinez, Jr., published a statement in the Fall Democratic Left, saluting Democratic Socialists of America; . 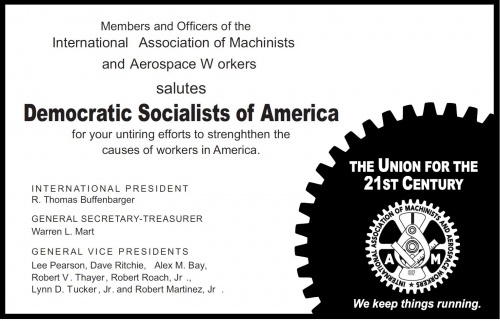 Members and Officers of the International Association of Machinists and Aerospace Workers salutes Democratic Socialists of America for your untiring efforts to strengthen the causes of workers in America. This page was last modified on 2 September 2011, at 12:00.